The following is in response to an open letter published on the AgBioWorld Facebook page by Professor Tony Trewavas of Edinburgh University. This response is also posted on the GM Watch, Global Research, Countercurrents and RINF websites. Tony Trewavais wrote his letter after reading my article ‘So You Want to Help Africa Mr Paterson? Then Stop Promoting Ideology and Falsehoods to Push GMOs’. The article originally appeared on a number of prominent websites. On Global Research, the piece appeared under a different title ‘The Propaganda Campaign in support of GMOs’ (read here). Professor Trewavas is a prominent supporter of GMOs in Britain. His original letter is provided in full below my response. Second, you claim that I fear GMOs will not be a disaster for African farmers but a success. Not true. You have ignored the fact that a number of GMO projects in Africa to date have indeed been failures and in my article I provided a link to a report to highlight this (which you go on to conveniently dismiss as a ‘biased’ source). Third, you say that the word ‘choice’ is conspicuously absent from my article. Any objective reader would appreciate that the concept is central to it, not least where I discuss the ‘choices’ imposed on Ethiopia via the West’s ‘structural adjustment’ of agriculture (which I refer to at the end of the article). That was not a case of farmers ‘choosing’ to restructure their agriculture, but a case of policies being forced on them at a macro policy level. And this is one of the issues that I have with GMOs. Although you conveniently do not mention that part of my piece, Michel Chossudovsky’s analysis takes account of the way by which agribusiness conglomerates can and do set rules at the WTO, manipulate market forces and restructure agriculture in foreign countries for their own ends. That is very much related to ‘choice’ and its denial. You talk a great deal about ‘democracy’ but fail to address how this situation fits with your ideas of giving choice to farmers and not imposing authoritarian agendas on people. You say I should buy a farm and exert my choice to farm as I wish. Talk about exercising such a choice to the people in South America who Helena Paul wrote about (described in my piece). They are being driven out as agribusiness and the planting of GMOs (mainly for export) takes hold. She describes this as ecocide and genocide. 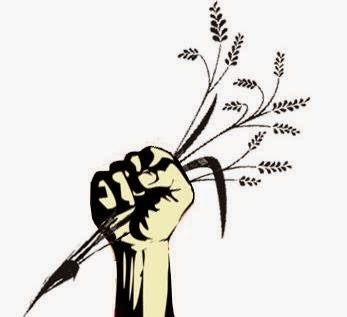 Tell it to the peasant farmers who are being forced from their lands by speculators and corporations as described by reports by GRAIN and the Oakland Institute last year. These are the people who feed 80 percent of the ‘developing world’, without GM technology, yet are being squeezed out. Where is choice and democracy? Fourth, nowhere do I say that only agroecological farming should be implemented to feed the world, as you claim I do. However, there are many studies and official reports that demonstrate the efficacy of organic and agroecological approaches that are well publicised. In my article, I referred to some of these studies and reports. But rather than regurgitating references, I would say that no matter what data is presented, certain people seek to marginalise agroecological approaches and prefer to focus on external input intensive ‘solutions’ and proprietary technologies, such as GMOs. In my piece, Daniel Maingi and Mariam Mayet mentioned the squeezing out of alternatives as a result of the impact of Western agribusiness in Africa. Are they to be dismissed as ‘biased’ sources too? First of all, I provided valid references which referred to peer-reviewed science in the article (and have again below), but all you can say is that my ‘political programme’ has “no scientific support”. I say to you: please stop justifying your own pro-GMO stance by smearing critics and rejecting any evidence because it does not fit your own agenda. Please do not talk about ‘choice’ and ‘democracy’ when your own agenda is to support powerful corporations who via the distortion of science and the capture of strategic national and international bodies deny choice. Your view of science is either deliberately misleading or simply naÃ¯ve. And for someone in your position, I find it difficult to believe it could be the latter. From acquiring funding and formulating the questions to be addressed, to conducting research, interpreting findings and peer review, politics are present in science throughout. The manufacture of scientific knowledge involves a process driven by various sociological, methodological and epistemological conflicts and compromises, both inside the laboratory and beyond. Writers in the field of the sociology of science have written much on this. I refer you to the following link, which contests your lofty view of science and scientists: ‘Monsanto wants to know why people doubt science’. It is not NGOs, groups, activists and campaigners that have failed to provide convincing arguments. And, by the way, to conflate such groups with intolerance, authoritarianism and killings by brutal regimes or groups is ludicrous and smacks of desperation on your part. You are a scientist but are using all the cheap smears and tactics of a lobbyist! When peer-reviewed science is provided by critics to support their claims, the onslaught by the GMO agritech industry and its mouthpieces against those who legitimately and scientifically contest the claims about the efficacy of GMOs is relentless. Just ask Arpad Pusztai, P. M. Bhargava, Judy Carman, Terje Traavik, AndrÃ©s Carrasco, Ignacio Chapela, Allison Snow, Marc LappÃ©, Britt Bailey, Bela Darvas and G. E. Seralini. These scientists have all either been threatened, smeared or hindered in their work because their research called into question the safety and/or efficacy of GMOs or associated products. The hypocrisy of those from the pro-GMO lobby who call for sound science to inform the debate on GMOs is glaringly obvious. Those who argue against GMOs are accused of not having science or facts on their side and of engaging in propaganda, while it is clear the pro-GMO lobby that hurls such allegations is itself guilty of all such things. This tactic goes hand in glove with a strident populist agenda whereby the pro-GMO lobby portrays itself as on the side of the people, while its opponents are ‘elitists’ and are ‘stealing food from the bellies of the poor’. If you really do value democracy as much as you say and wish to call to account those who show contempt for it, you would do better by reading Steven Druker’s new book ‘Altered Genes, Twisted Truth’. Instead of attacking Greenpeace and other groups, you should be more even handed (and employ just a little ‘scientific objectivity’ in your approach) by looking at the fraudulent practices and processes in US government departments that led to the commercialisation of GMOs in that country. What you claim to be ‘biased’ sources have demonstrated that the claims made on the back of many studies on GMOs are not supported by the evidence and that in many instances certain findings are marginalised as not being significant when they actually are (I supply these two links which provide reference to support my claims, the first of which you have already dismissed as being from a biased source, without addressing the issues raised therein: ‘An evidence-based examination of the claims made for the safety and efficacy of GM crops and food‘ and ‘Adverse impacts of transgenic crops/food: a compilation of scientific references with abstracts‘). The GMO biotech industry carries out inadequate, short-term studies and conceals the data produced by its research under the guise of ‘commercial confidentiality’, while independent research highlights the very serious dangers of its products. It has in the past also engaged in fakery in India, bribery in Indonesia, smears and intimidates those who challenge its interests and distorts and censors science by restricting independent research. If science is held in such high regard by the GMO agritech sector, why engage in such practices and why in the US did policy makers release GM food onto the commercial market without proper long-term tests? If you really do believe in dispassionate, objective discourse, then adopt an even-handed approach. You talk so much about democracy and choice yet there is no mention whatsoever of the crimes, cover ups and decades of environmental pollution that a certain company that forms part of the pro-GMO lobby has been involved in. You talk about choice and democracy but say nothing about how big agribusiness has at international and national levels captured policy making bodies to effectively impose ‘choice’ on US consumers and poorer nations and devastate local economies. Where is your condemnation? Where is your condemnation of ‘big list’ studies and fallacious claims made by the likes of Jon Entine about safety and efficacy on the back of them? Or are your condemnations, attacks, misrepresentations and ridiculous assertions reserved for those who flag up such things? In finishing, I would like to make clear that I do not belong to any environmental or campaign group. I received no payment for the article you responded to. This is why I refer to myself as in ‘independent’ (not freelance) writer.